The rain is falling and the temperatures are finally increasing so it looks like spring is finally here. In the coming weeks once the buds have swollen with all that energy from the roots it will be time to repot some of my trees. As you may have already seen many of my trees are in deep plastic pots, either because they were brought from a garden centre or because I planted then into these when they were dug from the ground. With some of the trees it takes time to prepare the roots to fit them into a shallow pot. Once the roots have been prepared to fit into a bonsai style pot then the next step is to find a pot that best suits the size and style of the tree. Unfortunately it isn't so easy here in Finland. There are many places that sell bonsai trees, mainly malsai type in 15-20cm pots, but nothing else is available from these places. 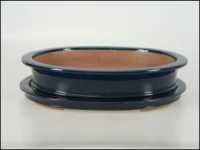 The only possibility to obtain different pots is to purchase these online from another country. 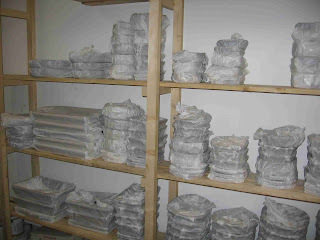 There are many online shops in many countries supplying pots, tools and other accessories but the biggest problem with this is the high delivery costs when shipping to this part of the world. 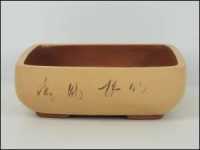 With this in mind, and to cater for my own needs, I decided to start an online shop back at the end of November called "Raisio Bonsai and Garden" ("Raision Bonsai ja Puutarha" in Finnish) selling bonsai pots, tools and accessories. I understand that the demand here in Finland is not very high compared to many other European countries, and this has much to do with the population of just over 5 million and the harsh climate we have in this part of the world, but there is still a demand so the company has now become part of my interest in bonsai. Even though my initial stock wasn't very big I still tried to purchase many different shapes, sizes, styles and colours of pots. I myself was looking for bigger pots than those that come with bonsai trees normally available in garden centres. This meant that most of my pots at the moment are 20cm or bigger, but soon I will be receiving more pots and many of these will be covering the smaller sizes. Choosing the correct pot to achieve the maximum effect for your bonsai can be a challenging decision, especially when first starting to make bonsai. The basic guide below is my conclusion from many guides that can be found on the Internet and is what I try to use when choosing the correct pot. Size of the pot depends on the size of the bonsai tree. 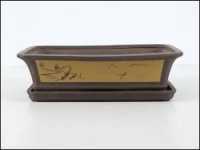 Shape and style of the pot depends on the type and style of the bonsai tree. Rectangular pots = Masculine trees such as Pines and big Maple trees. 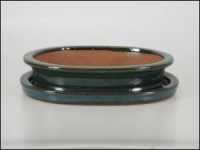 Oval pots = Feminine trees such as Maples (Japanese) and flowering trees. 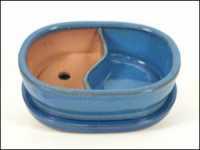 Oval pots are also suitable for forests or where the tree has many trunks. 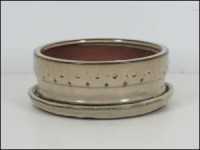 Round pots = Feminine trees such as Pines and Maples with tall narrow trunks. Style of the tree tends to be literati. 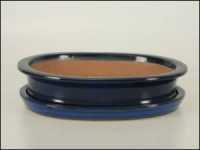 Colour of the pot depends on the class of the tree, masculine or feminine, and the type of the tree. Dark brown / Red / Unglazed brown = Pines and other conifers. Light brown / Creme = Maples and other similar tree types such as Birch and Oak. Green = Maples and other similar tree types. Light blue = Flowering species. Dark blue = Pines and Maples. 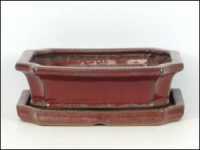 There are many different shapes, sizes, styles and colours of bonsai pots available that means that the mix of pot and tree could potentially be whatever. At the end of the day it is what you feel happy with and what looks pleasing to the eye, but I hope that my basic guide helps to give some ideas.